A rigorous solution of Maxwell's equations for transverse MO effect in multilayer structures is obtained. A derived scalar dispersion relation (14) describes optical plasmons, waveguide modes and transverse Kerr effect in multilayer structure. It is an example of method, which I have developed for solution of Maxwell's equations in multilayer structure. It is very simple, but a very effective and powerful method. It allows simple quick and rigorous calculations of the transverse MO effect even for a structure with large number of layers. Rigorous calculation means that any assumptions or approximations are not used. I will derive the dispersion relation, which describes the transverse MO effect in cases of waveguide modes and surface plasmons propagating in a multilayer MO slab. Since the permittivity tensor of a MO material has non-zero off-diagonal components, the wave propagation in MO structure is conventionally described by a dispersion relation, which is a combination of (4x4) matrixes. Because of the complexity of this dispersion relation, the approximation of small off-diagonal components is often utilized. However, in the case of the transition metals, the off-diagonal components have the same order of magnitude as the diagonal components and that approximation is not always valid. 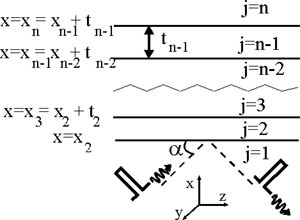 In the following, without use of any approximations we will derive a scalar dispersion relation, which described the transverse MO effect in a multilayer MO slab. 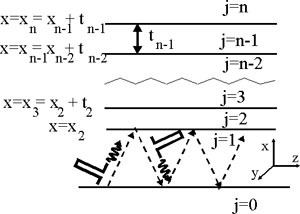 The availability of the simple scalar dispersion relation significantly simplifies analysis and predictions for the transverse MO effect. 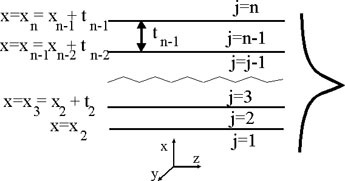 and tj are the permittivity tensor and the thickness of each j-layer, respectively. The layers of the slab are infinite in the xy-plane and the wave propagation direction is along z-direction. It is important that the value of Z in the last n-layer is always known. Since there is no back traveling wave Ab=0 when , it leads to Abn=0 and Zn=1. Knowing the value for Z for n-layer, from (11) the value for (n-1)-layer can be found. Knowing the value for Z for (n-1)-layer, the value for (n-2)-layer can be found and so on. (14) is main result. The Eqn. (14) can be used to derive reflectivity of MO multilayer and dispersion relation for surface plasmons and waveguide modes. Below we will show how to apply (14) for different structures. Fig.1 Reflection of light from multilayer structure. In this case we will find the refractivity of a plane wave from a multilayer MO structure. The refractivity is different for two opposite direction of the magnetic field. The reversing of the magnetic field corresponds to the reversing of gama sign . The (20), (21) and (23c) describe the reflection of the wave from multilayer structure. Fig.2 propagation of a waveguide mode or a surface plasmon in a multilayer structure. Let us consider the case of a surface plasmon or a waveguide mode, which propagates in multilayer structure shown in Fig.2 and having effective refractive index kz. kx for each layer can be found from (17). The optical field in the last layer j=n is described by (18) , the imaginary part of kx in this layer should satisfy (19) and Zn=1. The (26) is the dispersion relation describing a waveguiding mode or a surface plasmon propagating in multilayer structure. In the case a multilayer waveguide, the dispersion relation (26) may have several solutions corresponding to each mode number. In the case if only the cover layer of the waveguide is a multilayer and the waveguide core consists of only one layer (See Fig.2), the (25) can be simplified and dispersion relation describing each mode can be found. Figure 3 shows a waveguide with a multilayer cover layer. The layer j=0 is the cladding layer. The layer 2 is core layer, in which the waveguiding mode is confined. The core is covered by a multilayer structure. where Z1 determined by (20) and m is a mode number.